The Japanese Space Agency (JAXA) is probably celebrating right now, as their Akatsuki orbiter reached Venus on December 7. 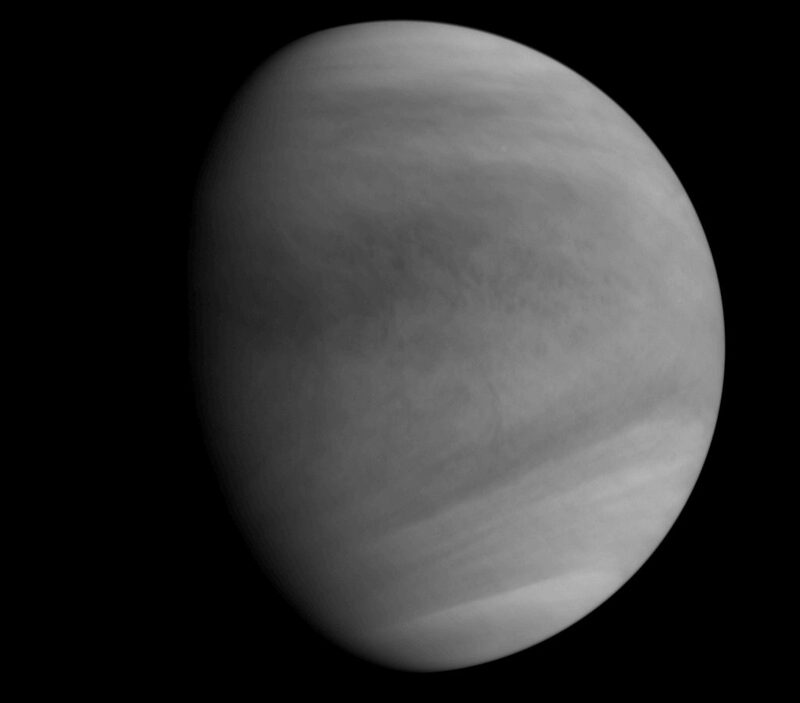 Unprocessed view of Venus’ atmosphere as seen by Akatsuki’s Ultraviolet Imager (UVI) at around 2:19 p.m. on Dec. 7 (Japan Standard Time) at a distance of 72,000 km (45,000 miles). JAXA. The first time JAXA tried to do this in 2010, they failed because the engine malfunctioned, and the shuttle didn’t enter the Venusian orbit. Aimlessly wandering into space without its main engines, the spacecraft appeared doomed – and many would have simply abandoned it. But not JAXA. Using some clever engineering, they managed to nudge Akatsuki bit by bit towards Venus, ultimately settling it into orbit. The spacecraft is still in good shape (except for its main engine), deploying its cameras and giving us some fresh images of our planetary neighbor. These photographs capture the planet in ultraviolet, revealing Venus’s wild clouds as well as the upward diffusion of sulfur dioxide from atmospheric circulations. Considering that the shuttle was set to spend six months (not years!) traveling to Venus, and then record for two years, it’s absolutely remarkable that it works so good now. The fact that they were so creative in using the side thrusters and that Akatsuki still works so well makes it the true comeback kid of 2015. Venus is drastically understudied, and Akatsuki will help us better understand the atmosphere and weather on Venus as well as confirm the presence of active volcanoes and thunder. It can help us figure out why Venus and the Earth are so similar in some regards, yet so extremely different in others.